simple chicken thighs are my go-to at home dinner! not gonna lie though, this yogurt is my favorite part of the recipe! Preheat oven to 350-degrees. Heat a cast iron skillet over medium-high heat. Season chicken thighs on either side with salt. Place thighs skin side down in hot skillet and sear until browned and the skin is crispy, about 10 minutes. Flip chicken and pour This Little Goat went to Korea equally over each piece. Move skillet to preheated oven and cook until the chicken has reached an internal temperature of 165-degrees, about 20 minutes. Remove pan from oven and tent with foil to keep warm. Pour pan juices off into a bowl and let cool. Once cool, whisk in Greek yogurt. 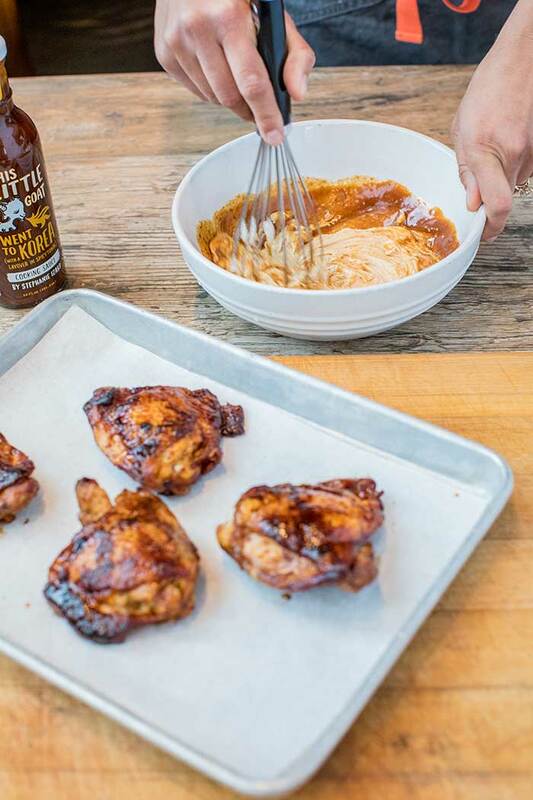 Serve each chicken thigh with a dollop of the sauce.